Throughout history, demons have invaded our world. We know them best through mythology and story – the proverbial monsters lurking beneath our beds and sneaking up our coastlines. Monstrous, deformed imitations of life, demons range from animal nature, to half-animal half-human hybrids, to fully shaped humanoid demons who walk our streets as neighbors, friends, and even lovers. While today most people believe the creatures faced by Odysseus and Hercules are nothing but myth, one group knows the truth. The Keepers. When first arriving in this dimension, demons are at their weakest. The need to feed overwhelms all else, and all newly-arrived demons can be lured in with bright light. In order to remain in this dimension, a demon must consume plant and animal matter from our world. Each kill strengthens them; each kill prolongs the time before the next is needed. Just as with animals, demons could be classified by their order and species to understand their separate strengths and weaknesses; an enemy understood is an enemy that can be killed. What are the different orders? Good question. Here’s a brief breakdown of demonic orders with a few examples from ancient mythology. Please note: this list is by no means comprehensive. Our archives are always growing with new monsters and examples. First-Order Demons: By far the most dangerous of all demons, first-order demons take human form soon after arriving. With each kill, a first-order demon consumes the memories and knowledge of its victims, beginning the transformation to human form. A first-order demon will take the full physical form of the fifth person it killed while retaining the thoughts and memories knowledge of its previous victims. In rare cases, a first-order demon will learn to change its form into one of its previous victims. Although the rarest form of a demon, they are capable of the greatest destruction because they can pass in the human world almost undetected and the elders possess high intelligence. Historically, first-order demons have been responsible for some of the greatest massacres of all time: Genghis Khan, the Heaven’s Gate cult, and lady Erzsebet Bathroy. Second-Order Demons: While not able to blend in the human world as well as first-order demons, second-order demons are still highly intelligent and very dangerous. Most second-order demons are hybrids: half-human, half-animal blends gifted with the features and characteristics of both species. Some well-known second-order demons include centaurs, harpies, satyrs, and minotaur; however, any animal-human combination is possible. Centaurs – A demon with the legs and body of a horse and the head, arms, and torso of a man or woman. Harpies – One of the most devastating of female demons, these creatures have the claws and wings of a bird with the head and torso of a woman. Third-Order Demons: Often the most frightening form of demon, third-order demons are animal hybrids. They range from a combination of two animals to sometimes three or four animal parts mixed together into one creature. While not possessing great intelligence, these demons are often quick and strong. They are also extremely hungry and vicious. In order to stay in our dimension, they must consume twice as much human flesh as first- and second-order demons, although they can also survive entirely off of animal flesh. 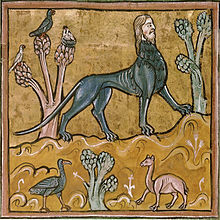 Manticore – a monster with the head and body of a lion and the tail of a scorpion and wings of a bat (though it’s mistakenly thought to have a human head in many histories). Fourth-Order Demons: Entirely animal in form, fourth-order demons still possess a great level of cunning. Most third order demons have multiples of some extremity. Common third-order demons include the Cerberus, Hydra, and Orthrus. The extra arms, heads, or other appendages grant greater strength or intelligence depending on sub-species. Cerberus – Three-headed, giant hounds with jaws capable of biting a human leg in two. Fifth-Order Demons: The weakest and most easily killed of all demons, fifth-order demons are nothing more than animals of extraordinary size. Like third- and fourth-order Demons, they must consume twice as much human or animal to remain in our dimension. Often they seek out dark places such as caves, forests, or the ocean for easy hunting. Although many are strong, they have no other special skills or features outside of what their animal form normally possesses. Abaia – Huge magical eel capable of electrifying and paralyzing its prey. Karkinos – A giant crab whose pincers could cut a person in half.